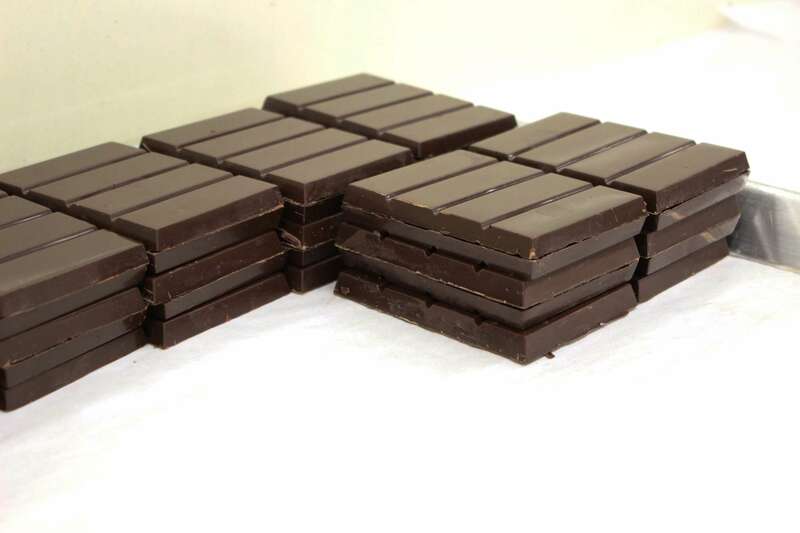 Is there anything as delicious as a fresh bar of chocolate? The smell. The texture. The taste. 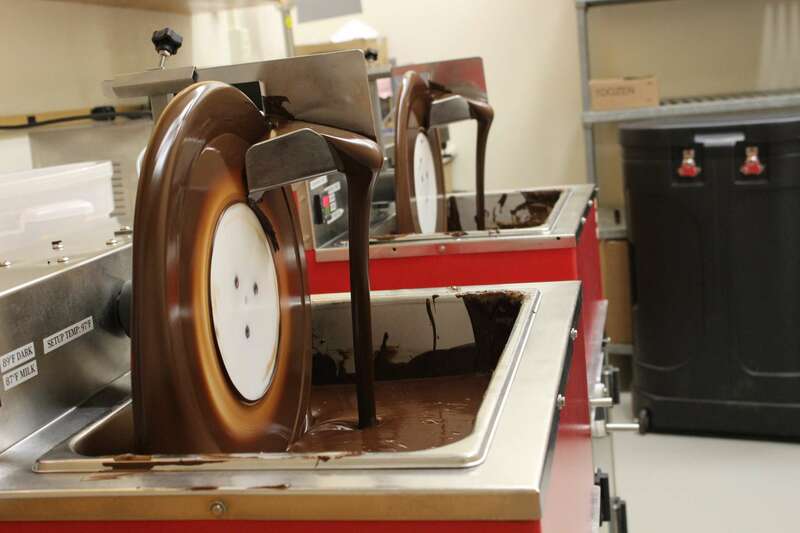 Whatever it is that draws you to chocolate, Cal Poly Chocolates perfects it. The process of creating chocolate is a mix of patience, quality control and troubleshooting. 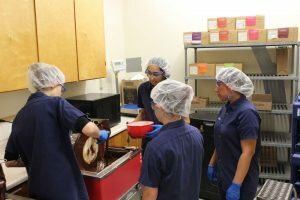 On Jan. 24, Mustang News had the chance to sit in as a team of 10 students created the flavors of the week: dark chocolate raspberry crisp. 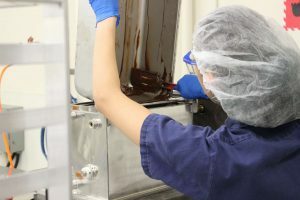 Though it isn’t Willy Wonka’s wonderland, Cal Poly Chocolates nonetheless brings the spirit of that chocolatier to life. The talented and disciplined group of students endeavor in the labs of the Food Processing (building 24) to create the perfect chocolate bar. When the chocolate first comes to the Pilot Plant, it is in a relatively raw form, shaped in shallow tear drops. 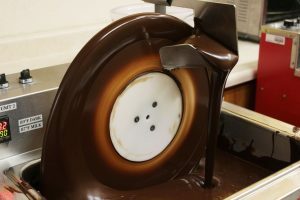 They mix it into a tempering wheel that slowly melts and churns the chocolate until it is smooth. 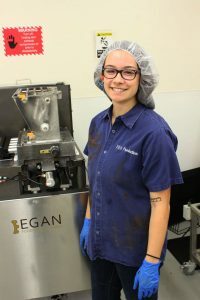 Food science senior and Cal Poly Chocolates student manager Rachel Rosenbloom explains why the heating is vital to good chocolate. 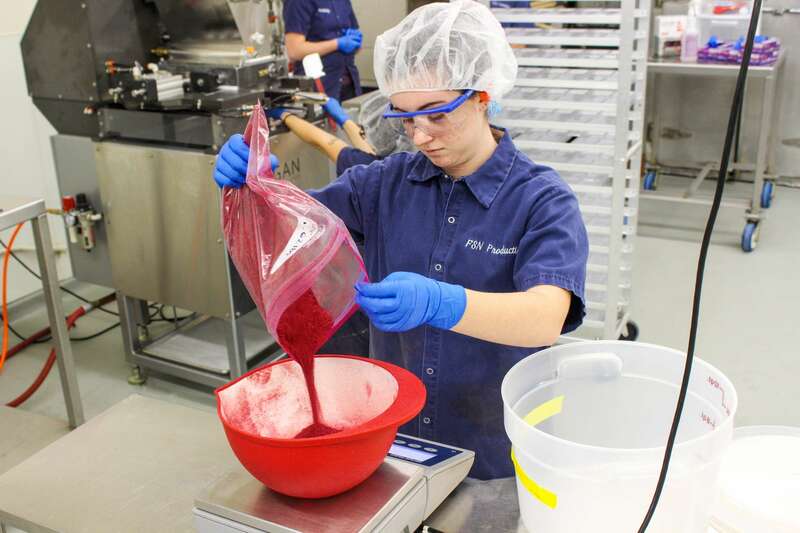 While it churns, flavorings like freeze dried raspberries are mixed in. Through this process, Cal Poly Chocolates produces anywhere from 100 to 125 pounds of chocolate per week. 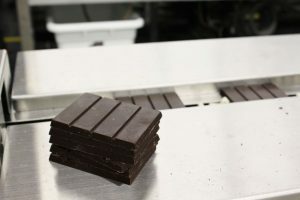 From its cycles on the wheels, the chocolate is poured into a depositor machine that equally distributes chocolate into mold trays, each with five bars. 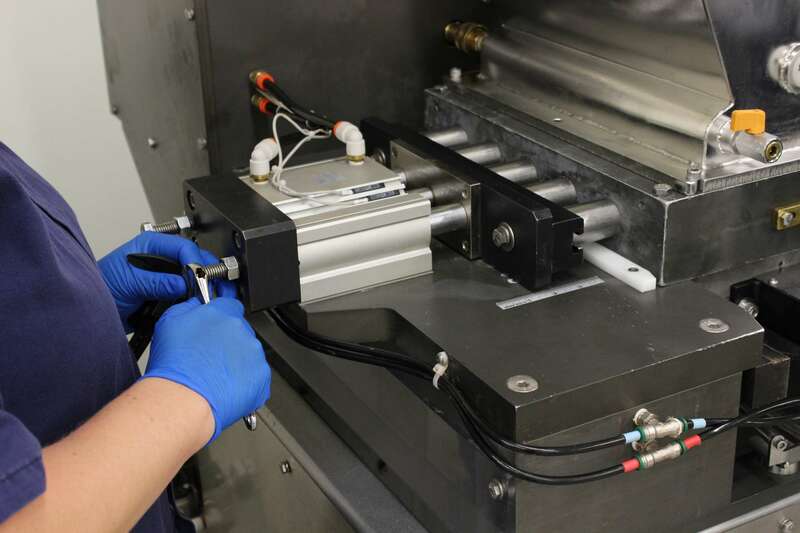 The machine is prone to deviation and the variation in flavors and fillings means it needs constant adjustment. 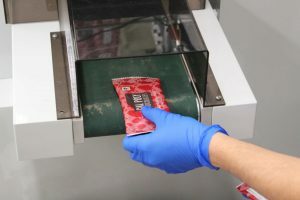 For example, flakes of freeze-dried raspberries get stuck inside the machine and impede the flow, making adjustments a necessity. 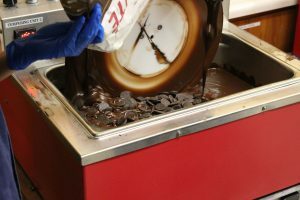 These molds, now filled with chocolate, are taken to the vibration table. Students press molds to the table to shake the chocolate to remove any air bubbles, ensuring the chocolate seeps into every crevice and keeps its shape. Once enough molds are shaken, they cool and harden in a separate room. 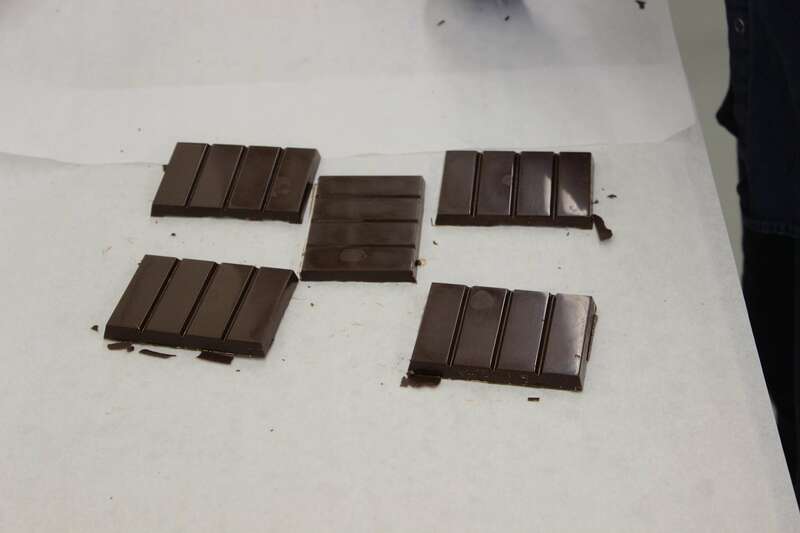 Rosenbloom shared some trade secrets for chocolate. 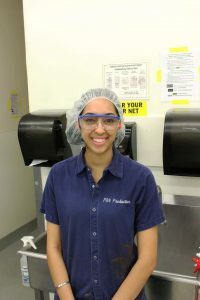 Food Science sophomore Taran Virdi breaks the chocolate from the plastic molds. “If the chocolate has sat correctly, then they’ll pop right out,” Virdi said. 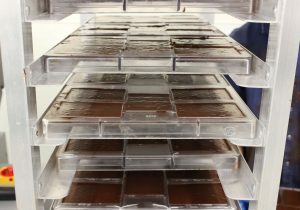 With two taps and a swift turn, the chocolate is out and in perfectly formed bars. The bars are stacked and stored for packaging the next day. 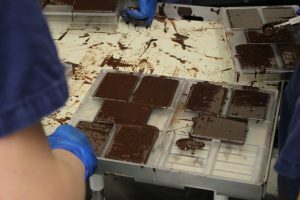 The next morning, the bars are lined up and the packaging machine is primed. 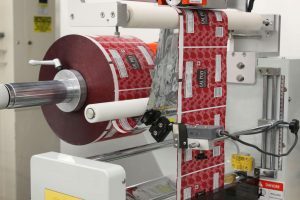 Centered on a large reel, the wrapping paper is nearly 10,000 “impressions” long and roughly the size of a basketball. 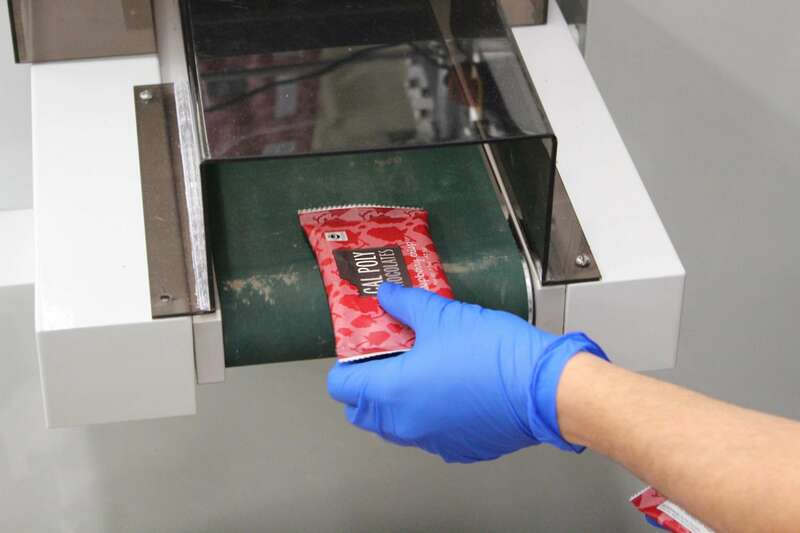 The origami machine seamlessly and folds more than 1,000 chocolate bars in 30 minutes. Bumper to bumper, the bars move along, quickly and carefully nestling into a coat of red wrapping. They move over a heated plate to melt the adhesive seal and are precisely cut to form that perfect rectangle. The chocolate is taken from the belt and placed in boxes, ready for distribution. According to Molly Lear, the food science and nutrition operations manager, they often sell their chocolate so quickly that Cal Poly Chocolates cannot keep up with every flavor. In addition to the benefit of attending class smelling like chocolate and raspberries, Cal Poly Chocolates offers students tantalizing industry experience. For the student manager, the work allows her to hone her troubleshooting skills and find out what works — and what does not. 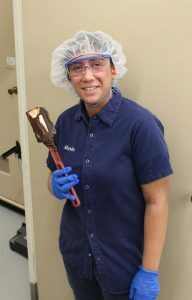 Draped in chocolate-covered lab coats, the students bring heart and personality into their craft, and their chocolate reflects that. To these students, chocolate can be more than just a sweet treat. For food science freshman Ally Taylor, raspberry crisp was the first chocolate flavor she made with Cal Poly Chocolates. She shared her thoughts about her first day. 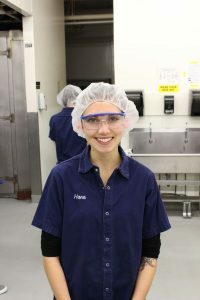 Cal Poly Chocolates is an organization that embodies the Learn by Doing philosophy while facilitating community. The students create lasting memories and build career skills. It just so happens that the sum of all this is great-tasting chocolate. For more information, check out Cal Poly Chocolates’ Facebook @CalPolyChocolates or follow the entire Cal Poly Food Science and Nutrition Production’s Instagram @cpfsnproduction. 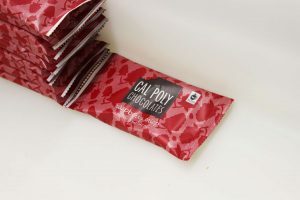 Cal Poly chocolate is sold on campus at the University Store, Campus Market or Village Market. You can also find products at a number of off-campus locations, including the Downtown University Store and local and gourmet grocery stores and shops.